Hiroki Narimiya: Dentists in training. 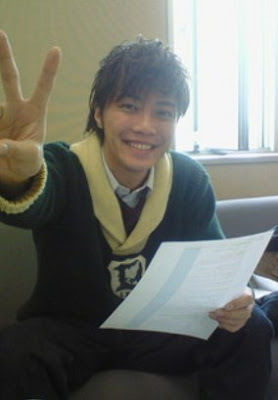 It's finally starting, Narimiya blog. There are, by no means, any designs to this. For me to write a blog is a little strange. But I'll be having fun as I liven it up. There was a talk event for the Nippon Dental University school festival today. But I went to work, with the dentists in training, with a face that didn't look like I did (oversleep) at all. I was nervous as it's been awhile since I did a public talk. The dentists in training wore pink polo shirts illustrated with a deer. Why is it a deer ?? Ah-, because it's a dental university.